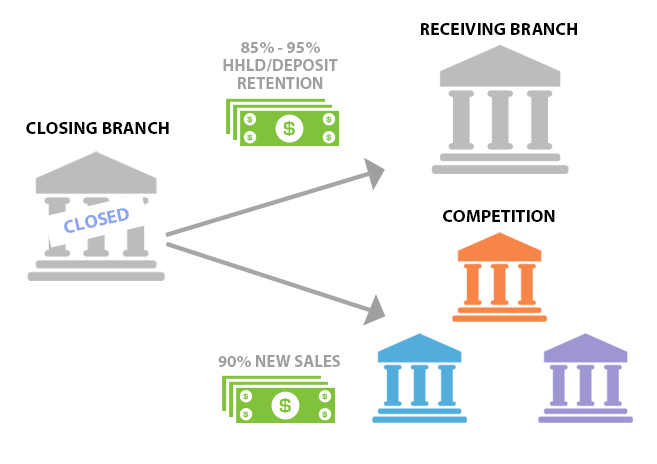 Typically, when Banks or Credit Unions close or consolidate a branch, they have challenges maintaining revenue growth from the market they exit, and lack a strategy to retain deposit and household growth. How do you close or consolidate within your branch network and still maintain high quality service and brand awareness? 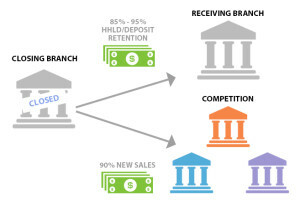 When a branch closes, the majority of new sale opportunities go to the competition. We have industry leading experience, having closed over 500 branches that resulted in 95% retention of deposits and households while exceeding revenue targets. Our engagement is fulfilled in two parts. First, we will analyze your financial, transaction, and productivity metrics. This will provide a full list of branches to watch as well as initial closure opportunities. Next, we conduct a thorough field analysis using branch financials, real estate impacts and market dynamics that result in final recommendations. The second part of the engagement includes the development of an Operational Playbook that houses effective strategies for rolling out a multi-year consolidation/closure plan. This playbook will provide a step by step procedural manual on everything from regulatory filings, internal & external communications, customer retention strategies as well as gap analysis for digital sales.